Russia has successfully completed pop-up tests of its new intercontinental-range ballistic missile (ICBM), the super-heavy thermonuclear-armed RS-28 Sarmat (NATO designation: SS-X-30 Satan 2), the Russian defense ministry said in a statement on July 19. Pop-up tests are meant to test the mechanism of a missile leaving its launch container or missile silo. The RS-28 is ejected from its silo by compressed gases before the missile’s booster engines are ignited. The July 19 defense ministry announcement appears to confirm speculations that Russia conducted a third ejection test in May of this year. Prior to that, Russian missile engineers last conducted an ejection test of the RS-28 ICBM in March. This was preceded by another test in December 2017, which revealed numerous technical deficiencies with the pop-up mechanisms of the silo-based launchers. All pop-up tests have taken place at the at the Plesetsk space center, located in Arkhangelsk Oblast approximately 800 kilometers north of the Russian capital, Moscow. 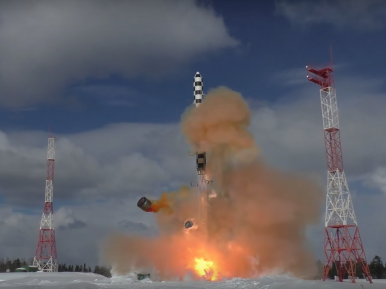 Following the successful completion of ejection trials, Russian missile engineers are now readying the RS-28 ICBM prototype for its first test launch, which can be expected in the coming months. While the previous pop-up tests only involved the ignition of the first-stage and booster engines, the next set of flight tests will include launching the second- and third-stage engines. The first test of the RS-28’s first-stage engine, named PDU-99 — most likely a modified version of the RD-274 liquid rocket engine used on the RS-36M2 Voyevoda (NATO designation: SS-18 Satan) — took place in August 2016. The Avangard (Vanguard in English) warhead has already entered serial production, according to the Russian government. “The Russian defense industry has completed developing the Avangard missile system with its principal new armament — the hypersonic warhead. Industrial enterprises have switched to serial production [of the Avangard].” the MoD said in a July 19 statement. One RS-28 will be able to carry three to five Avangard warheads. The Avangard hypersonic boost-glide warhead is expected to be inducted into service in 2019. As I reported in March, the first Strategic Rocket Force regiment armed with the RS-28 ICBM is slated to deploy by 2021, although Russian President Vladimir Putin has reiterated earlier this year that he wants the missile to enter service already by 2020. The silo-based RS-28 is expected to replace all RS-36M2s currently in service with the Strategic Rocket Force by the mid-2020s.